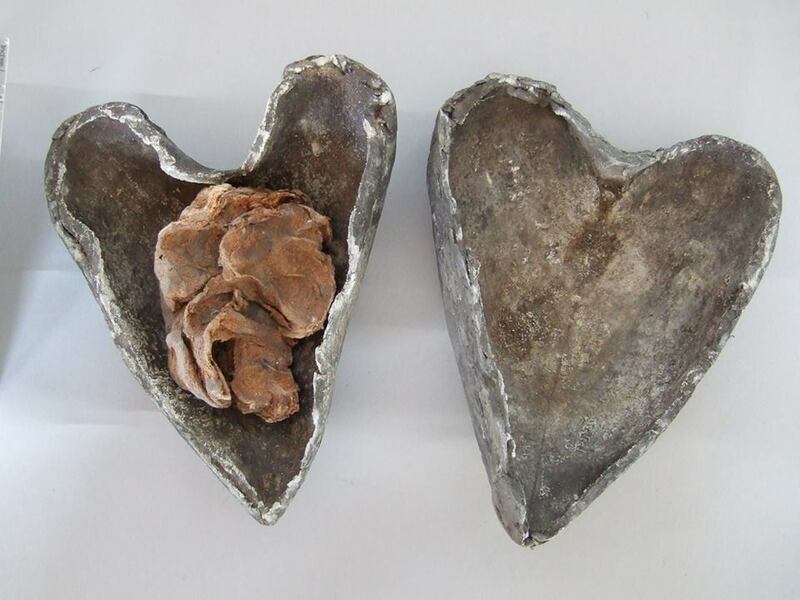 This heart-shaped lead casket containing an embalmed human heart was discovered inside the medieval crypt of Christ Church, Cork city (now the Triskel Arts Centre) during the 19th century. An unusual find, it is not without parallel in Ireland, as a similar example is also known from Christ Church Cathedral, Dublin. This contained the heart of the Archbishop and Saint, Laurence O’Toole, who died in AD 1180. Further afield, the heart of king Richard I of England received comparable treatment on his death in AD 1199. It was removed from his body, embalmed and then placed in small lead casket, which was buried next to his brother at Notre Dame cathedral in Rouen, France. In a similar vein, when Robert the Bruce of Scotland died in AD 1329, his heart was placed within a lead casket, with the intention that it would be brought to the Holy Land. Although the owner of the Cork heart is no longer known, these parallels do suggest that it most likely belonged to someone of high standing. The heart-shaped casket now forms part of the Pitt Rivers Museum collections. Where is the Pitt rivers museum ? The Pitt Rivers is the most amazing museum! If you’re in Oxford it’s really worth a visit. And it’s right next to the natural history museum, which is also great.